It's Monday night at an almost empty, seedy Bronx bar in the mid-80s and five 32 year olds are not quite sure where their lives are headed, or even what exactly it is they want. What they do know, is that they want change, excitement and passion, and they want it now. 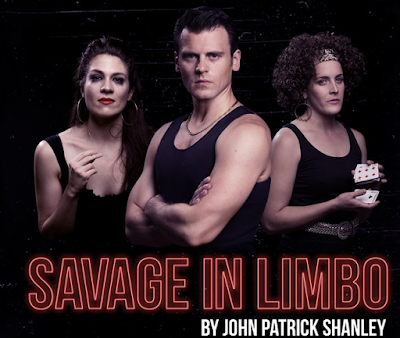 Savage in Limbo by acclaimed playwright John Patrick Shanley offers a comedic yet honest look at hope, dreams and missed opportunities. Sarah Nicolazzo is the shining star of this production as Linda Rotunda, the local girl that all the men know. Her boyfriend has just announced to her he wants to see ugly girls and she is just a little distraught. Nicolazzo delivers a brilliant performance and the physicality and facial expressions she uses to portray Linda are highly natural. Samantha Mesh as the title character, Denise Savage, convincingly displays the pent up frustration of where Denise's life has led. She is still living with her mother, single and unhappy. Something has to give and she's decided that it's going to be her virginity, and possibly to Linda's boyfriend. Nicolazzo and Mesh are highly entertaining to watch and bounce off each other well in their equally strong performances. Antohny Scundi as the boyfriend, Tony Aronica, plays him with a level of macho naivety that actually has us disliking him much less than we ought to. Rounding out the talented cast, in more of a supporting role but still with plenty to say, were Kostas Ilias as Murk the bartender and Andrea McCannon as April, the alcoholic ex-nun. The design of the bar interior was well thought out, however I would have liked to have seen a bit more flair and colour with the costumes, especially given the period we were in. Having all five people dressed in black (apart from Murk’s shirt) wasn't always visually arresting. Thankfully this didn't affect the show much due to Gabriella Rose-Carter's direction in keeping the characters moving and active with each other. Apart from getting great performances from the cast, she also managed to keep them interesting when they were listening to each other, which I particularly noticed during the Santa Claus scene. Being 32 myself, I have found myself having similar thoughts and moments as these characters. Even though it's been over 30 years since Savage in Limbo was written, it's somewhat comforting to know that some things never change. Or maybe it should be unsettling? Either way, Q44 Theatre have made a commendable production that burrows into your mind for you to ponder over after the final bow has taken place. Venue: Q44 Theatre, 550 Swan St, Richmond.